SURF’S UP. RICE PADDIES. TROPICAL TREATS. Here we are going to share about how we lived it up with this simple, yet all-encompassing, itinerary. Being in Bali, it is not hard to find a spot where the surf’s up. Of the 10 days we were there, Bobby managed to surf EVERY day (even going out twice a few times)!! In Bobby's words, "the surf was big, the water was warm, and the froth level was high" (meaning Bobby never wanted to get out of the water). One of the best parts about surfing in Bali is that there are so many amazing spots with diverse scenery and waves. From surfing a reef while planes land over your head (Airport Rights), surfing a black sand beach in the jungle with nobody else in sight (Yeh Gangga), or surfing in front of the tiny Warung you slept in before (Balangan)... Bali surf can provide any backdrop. You can find world class barrels at Padang Padang on the Bukit Peninsula or slow rolling surf at Old Man's in Canggu. Bobby tried a little of everything, with his favorite spot being an incredible wave called Medewi. It's not as well-known as some of the other spots in Bali, so keep it hush-hush. Bobby was so excited when we got to our hotel that he was in his trunks with board-in-hand before he'd even taken his luggage to the room. Fortunately, he had the patience to settle into the room before heading out for a surf! If you're thinking "Surf's Up", Bali may be your spot. If you want to explore all the island has to offer, the Z-Lite bag is compact (yet spacious) enough to toss in the car alongside your surf gear. You may find the perfect wave and want to stay awhile! Rice is one of the staples of the Balinese diet. So much so that in the 9th century, the Balinese found a way to fill their sloping landscapes with rice. The irrigation system of canals, tunnels, and temples allowed for all the rice terraces, or rice paddies, to flourish... and man, are they breathtaking! While there are rice fields everywhere you look in Bali, not all are created equal. The rice fields in Ubud are worth a day trip, as they are so picturesque and majestic (and there is a monkey forest nearby!). We spent hours wandering through the fields, meeting the local farmers, and even having a beer with them! The beauty of the rice terraces wowed us, it's unlike anything we've ever seen before! Speaking of which, we had some of the best food we've ever had while we were in Bali. If only we could have packed some of them up in our suitcases! ;) Everything we ate in Bali was so good, so healthy, and so cheap! One of our favorite spots was called Crate - and it was as visually stunning as it was delicious! They had everything from whimsical smoothies to savory egg dishes, and (Bobby's favorite) “The Barber” where they stack French toast, fried banana, scrambled egg, and bacon all together. AH! Next up. Coconuts. We both had at least one EVERY day! Why not? When in paradise, and when they cost a dollar, why not rehydrate with some fresh coconut water with lime?! Definitely a rhythm we’d like to keep up at home! A tropical treat that doesn’t feel like real life: Balinese massages. For less than $10 you can have an hour-long massage. We'll say it again in case that didn't sink in: For less than TEN dollars you can get an HOUR massage - on the beach!!! It sure is easy (and affordable!) to treat yourself when you're in Bali! And our last tropical treat: the sun. For it’s tanning powers and the show it puts on at the end of each day. Both of us were able to bronze our bodies a few shades darker during our time under the Balinese sun. While we make sure to wear lots of sunscreen, we botha also appreciate a good tan. ;) And of course, the sunsets the sunsets in Bali are on a whole other level. The sun treated us well during our trip! Thank you to American Tourister for sponsoring this post! Luggage comes in all shapes and sizes, and most of us start with what we’re given. When we were younger, all we ever used was duffle bags. At some point, we matured and graduated to a two-wheeled carry-on. It seemed like the BEST thing ever compared to having your bag on your shoulder, and for about twenty years, both of us never thought to change things up. But then we came across Delsey Paris, and we realized we have been missing out on the 4-wheeled revolution. Over the past year, we’ve swapped out all our luggage for a fleet of Delsey bags, including the Chatelet, Titanium, Shadow 3.0, and Bastille Lite (our current favorite). While we are huge fans of the style and durability of hardside luggage, that isn’t the purpose of this blog. Here we want to share with you why we are convinced that 4-wheeled spinner cases are the way to roll. Pulling with the wrist vs. pushing with your body. First off, it really just feels easier to push your suitcase by your side as you walk rather than pull it. Assuming you have good wheels (Delsey bags are SO ridiculously smooth), pushing the bag really feels effortless. If you have bad wrists/shoulders and a heavy bag, pulling it all around the airport will eventually cause a sore wrist/shoulder. Pushing a slick four-wheeler really is as effortless as it gets! The 360-degree maneuverability is a game-changer. It really is the main reason why we love these bags so much. These bags allow you to quickly bring it in front of you if you need to go through a narrow opening or turnstile. Think about how many times the line to deplane is held up by somebody who’s two-wheeler can’t fit down the aisle. Glide a four-wheeler sideways, and that will never be your problem. When you hop on the subway/train, the four-wheeler can efficiently move into small open spaces. If you’ve never had the four-wheel experience, trust us and take one for a spin! Because why settle for two wheels... when you can have four? Our biggest traveling game changer. Let’s be real. Traveling with old, bulky, and broken luggage is the WORST. When we first started traveling together, we were both using suitcases we’d had for years - and those suitcases were the cause of several arguments, bad attitudes, and really, REALLY dramatic travel days. One day we realized we couldn’t do it anymore. Our luggage was weighing us down (literally), and the idea of trying to use them “just one more time” was not going to fly. We started investigating luggage and were immediately overwhelmed. Those of you that have shopped for luggage recently know that the possibilities are endless. There are countless brands, sizes, and shapes to choose from. Finding one that is actually durable, lightweight, and affordable is a lot harder than you would think. It took some research, but we found them. We were drawn in by their style and price, and then blown away by their durability, weight, and functionality. We hope that if you're in the market for new luggage, that you will trust us and give Delsey a try! 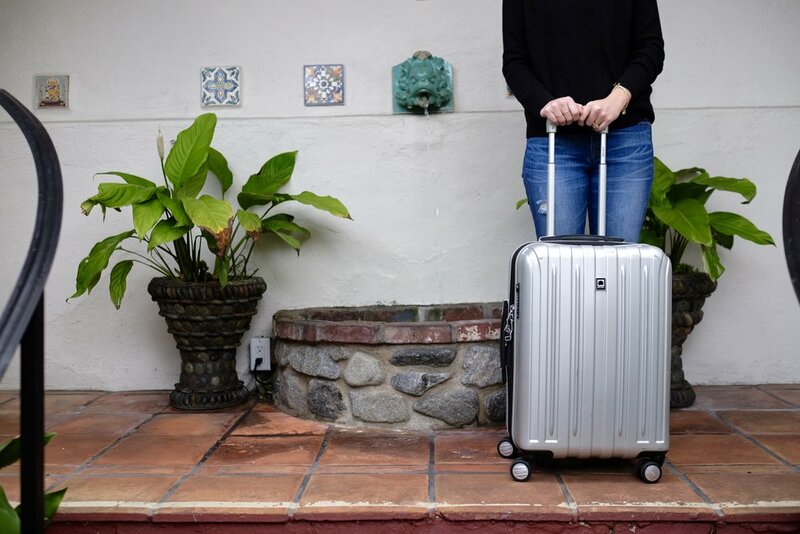 Delsey is a French luggage and travel accessory brand that has an impressive assortment of colorful, stylish, and theft-proof luggage pieces. We currently have 3, and will give you a brief rundown of each. First, we both have the Helium Titanium 21" Carry-On Expandable Spinner Trolley. Our favorite features are right there in the name. Helium. It is INCREDIBLY light. Titanium. It has a solid hard-shell exterior that will keep your delicate items safe and secure. Expandable. While this piece is a carry-on, it also has an expandable feature that provides you with more space if needed. Perfect for the souvenirs you need room for on the way home. Spinner. Neither of us knew that wheels could spin so smoothly on luggage. If you see us walking around the airport with these bags, it won't be uncommon for you to see Bobby shoving his bag and marveling at how fast and smooth it whizzes away from him. The smooth roll may not sound like a big deal, but we're confident you will let us know when you experience it and are as satisfied as we are. Next up is the Helium Shadow 3.0 29" Spinner Suiter Trolley. This is Bobby's go to for bigger trips where we are checking bags. Like the carry-on, this bag is light, hard-shelled, and really smooth. The unique part of this luggage is the top lid opening, which is super useful when packing and unpacking. The other piece we have is the Honore+ 27" Spinner Trolley. This is a beautiful piece of luggage. Along with the same Delsey features as the others, the Honore+ also features a heavy duty aluminum frame with a single click opening system. It is amazing. This case is stylish and sophisticated, and is Alli's choice to bring along whenever possible. So, friends, there you have it. Our biggest traveling game changer is definitely our Delsey luggage. We won’t leave home without them!